Or Spa-Peggy and Meatballs. Anyone? Anyone? Okay, in case you haven’t noticed, I’m a hard-core carb-lover here; pasta and bread are my ultimate comfort food. And does it really get any more homey and comforting than spaghetti and meatballs? Not in my world! 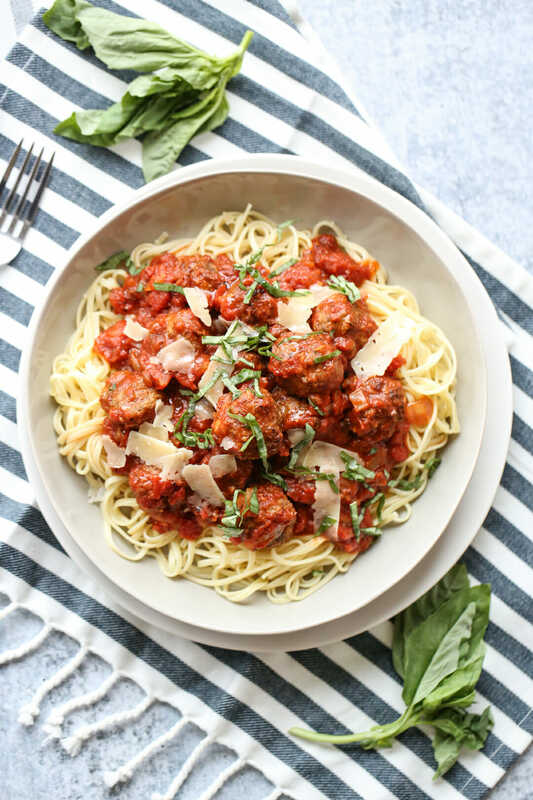 This classic recipe for Homemade Spaghetti and Meatballs is both comforting and simple, using mostly pantry ingredients and doable for even a weeknight dinner. If you can’t eat pasta, it’s also great over a bed of zucchini zoodles or roasted spaghetti squash. 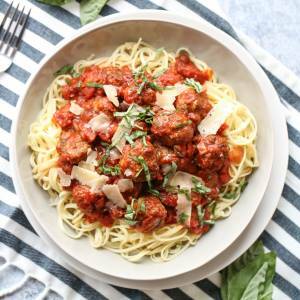 I didn’t actually eat spaghetti and meatballs, like, ever growing up; my family was more of the “mix a pound of ground beef with a jar of Ragu” kind of clan, which is totally fine. But there was a woman in my neighborhood who was married to an Italian and whenever there was a family that needed a meal, she would take them spaghetti with her homemade meatballs and sauce. Our family was never on the receiving end of her meatballs, but I heard about them and I longed for them. During my senior year of high school, there was a major crisis in our family. At that time, I was in our school musical and since, you know, the show must go on and all that, I had obligations I had to fulfill even though some things at home had fallen apart. After a particularly long night, I heard that this woman had brought our family spaghetti and meatballs and I couldn’t wait to get home and finally try them. I got home. It was gone. Eaten. I’m not sure I can describe the feeling of loss I experienced–I’d been hoping for one simple pleasure all night and got to eat a bowl of cereal instead. I never got to try this woman’s spaghetti and meatballs and I never got her recipe (I’m pretty sure it would have to be pried from her lifeless grip, anyway), but if I were to imagine my perfect spaghetti and meatballs, this would be it. With lots and lots to spare so no one’s stuck with a bowl of Lucky Charms. 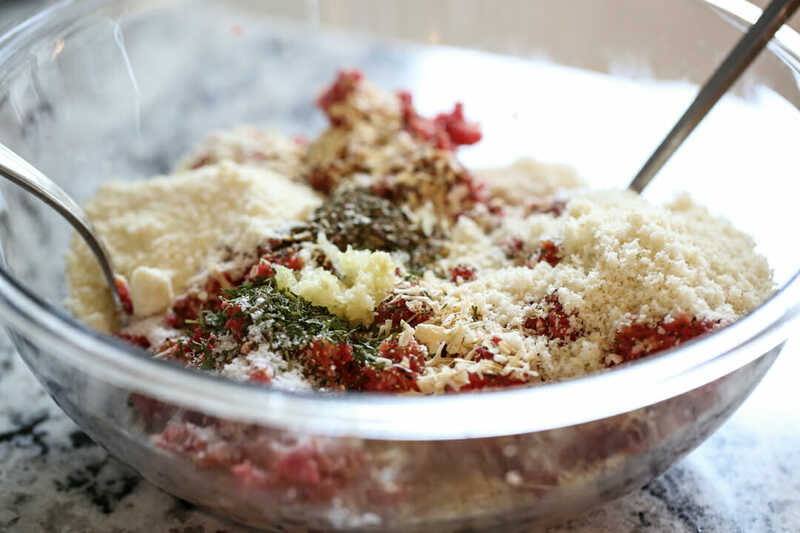 The meatball mixture itself uses a 50/50 mix of ground beef and Italian sausage and a handful of flavoring agents. If you don’t have any dry bread crumbs on hand, I often just toss 2 pieces of white bread in my blender and pulse them up and it works great. 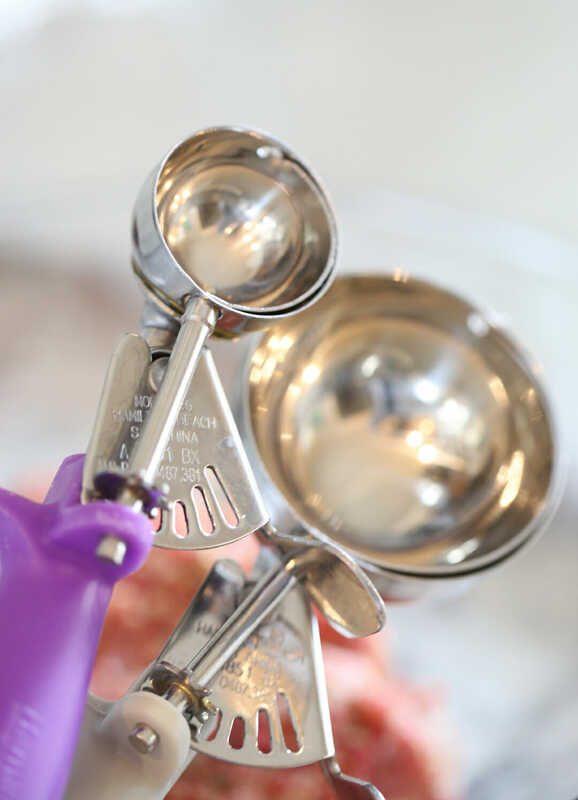 To make uniform meatballs, we recommend a cookie scoop. You can make them giant or tiny or anywhere in between. I like meatballs to be 1-2 bite meatballs, so a standard size cookie scoop works great. With that size you’ll get about 3 dozen meatballs. If you don’t own any scoops yet, this set of 3 is great, and will you several options- I use all three of those sizes quite a bit in my kitchen. These get a quick broil in the oven and just take a few minutes to get browned. This sauce comes together easily and it’s amazing how much flavor comes out of these simple ingredients. Since the tomatoes are what really shine here, I recommend using a good brand. I often use the cheapest can on the shelf for soups and stews, but if I’m making something like tomato soup, or spaghetti sauce, I’ll use something nicer. 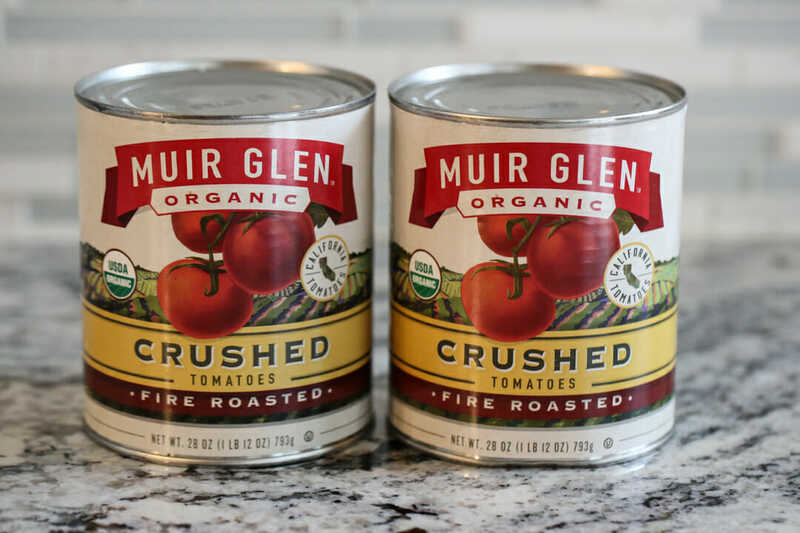 Muir Glen or San Marzano are always a good choice and available at most grocery stores. I’m using the fire-roasted, here, but regular is just fine. 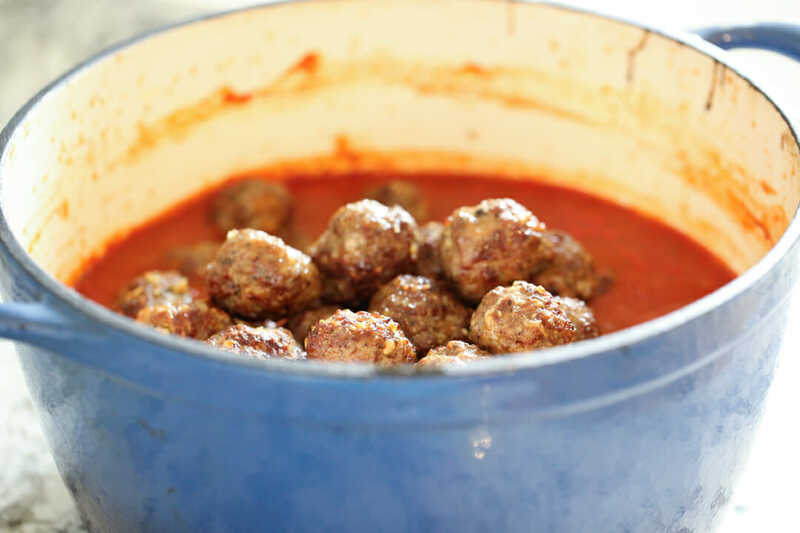 You’ll add those gorgeous meatballs to the pot of sauce and then let it simmer away. Don’t rush this part of the process- the longer that sauce simmers, the better the flavor develops and the thicker the sauce gets. Serve it over the noodles of your choice- spaghetti or linguini or angel hair work well and you can eat it over veggies instead, if you prefer. We love it with some thick shaved Parmesan cheese on top and a sprinkle of fresh basil. This recipe feeds a crowd, and also makes great leftovers. In our house, there are never any left over, but you could eat half for dinner, and put the rest of the meatballs and sauce in the freezer for another day. Either way, it makes a fantastic meal, with enough to share! 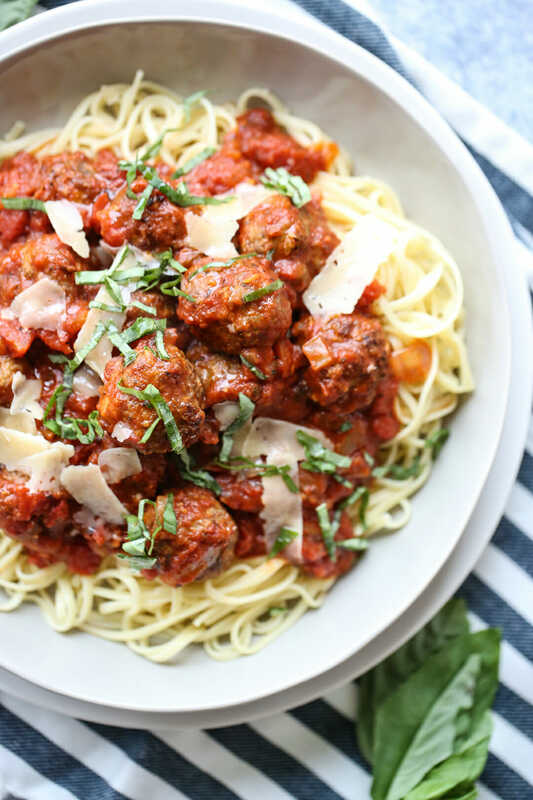 Flavorful Italian-style meatballs simmer in a classic spaghetti sauce that’s easy to make at home. *If you want, you could substitute all the Italicized ingredients with 3 Tbsp. garlic bread seasoning found here. Gently combine all meatball ingredients in a medium bowl. (It works best to use your hands, keep a box of gloves on hand if you don’t want to use your bare hands). Shape into balls, whatever size you like, but I prefer using my standard cookie scoop (about 1 tablespoon) to shape meat into balls and then rolling it between my hands to make them even more round. Place on a large cookie sheet and broil until the meatballs start to brown. Remove from oven and set aside until ready to use (or freeze for later use). Heat olive oil in a large skillet. Add onion and garlic and cook until onions are translucent and garlic is fragrant. Add remaining sauce ingredients and combine well. Bring to a simmer and add meatballs. Simmer on low, uncovered, until desired consistency is reached–about 25-30 minutes for a sauce that’s of medium consistency. 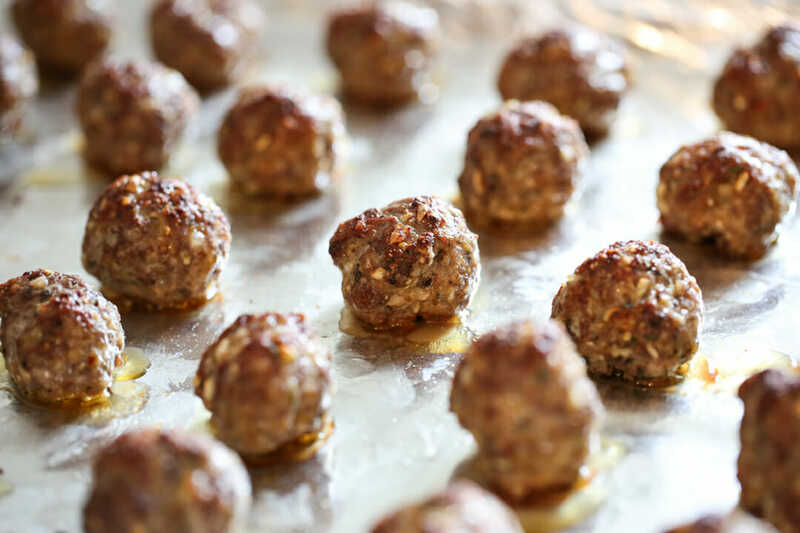 Prepare meatballs as directed, but divide the meatballs among two freezer-safe containers. Prepare sauce through adding all ingredients to the pan, but don’t simmer; rather, divide the sauce among the two containers. Freeze until ready to use. When ready to use, place in slow cooker and cook on low for about 5-6 hours, although you’ll want to keep an eye on the sauce and make sure it’s not burning if you go for the whole 6 hours. I always put fresh onion in my meatballs, but they make them fall apart…definitely trying the dehydrated route next time! These look delicious! I had the same problem, Mindy – until I started sauteeing the onions before adding them into the meat mixture. Maybe this will help you if you find you don’t care for the dehydrated option. This sounds just delicious. My boys love spaghetti and I don’t make it nearly enough. Thanks for the freezer tip! mmm…I haven’t had spaghetti and meatballs in so long. I think I’ll put them on the menu this week! And ya know what? I always use linguine, for some reason I like it way better than spaghetti! We never did the meatball thing either growing up, and now I LOVE THEM! I am so excited to make this. YUMMY YUMMY! This is perfect! I was just looking for a slow-cooker meatball recipe! Spa-peggy and meatballs! Do you happen to have an apple brown peggy recipe? 🙂 Love King of the Hill, especially now that we live in Texas…that show gives you a pretty accurate taste of the Dallas area. Yay, Kara, I’m so glad you got it! I watch an embarassing amount of TV, so sometimes I think I’m the only one who gets these obscure references… 🙂 And yes, I love King of the Hill, too. Sometimes I think I’m married to Hank…but I sure hope that doesn’t make me Peggy!! Looks so yummy! This is on my list to try. I wasn’t hungary, but i am now! You just can’t beat pasta with meatballs. Looks tasty. These look delish!! I might have to make these instead of the ground beef and ragu that I had planned for tonight. 😉 The only thing I don’t have is italian sausage. I’ll have to swing by the store on my way home. Is the only way to get it in giant link/casing style? Or can you buy it in a roll or something? Lacey–you can either buy it in links or just like you find a pound of ground beef. The un-linked sausage is actually quite a bit cheaper, so that’s nice, too! If you don’t have a kitchen scale and are using the links, you’ll need about 3. Comfort food to the max!!! I made this today and it is SO GOOD! I hadn’t found a spagetti and meatball recipe that I loved, but this I do! Thank you. I was too dead at the end of the day to go to the store, so I just used 1 lb of the beef and they turned out great!! So yummy. However, I was injured in the process of making them! I had my cookie sheet resting on top of the stove while it was heating to broil. Then (stupid me), I grabbed it to move to the other side of the kitchen and I HEARD MY SKIN START TO SIZZLE! Yeah. Ouch. It burned the worst right in the crease of my palm where my thumb bends. I just had my hubby roll the meat into balls for me while I drenched my hand in cold running water. Needless to say I will live to see another day of pasta and these fabulous meatballs. Kate, boy do I remember that traumatic high school event. But I don’t remember the spaghetti part. Wish I’d’ve known; I would have made you some more. 🙂 Love you. I made this the other night and it was a hit at our house. My 3 year old loved it so much he would kiss each meatball before eating it. LOL. Yummy! Made just the sauce tonight. Yum! We are not big meatball fans so we just added browned hamburger to it. This is my new go to recipe to replace jarred spaghetti sauces that I just cannot stand to eat any longer. I used one can of fire roasted crushed tomatoes and one regular. Yum! Thank you. I can always count on Our Best Bites for a great recipe, every time. I made these over the weekend with Prego for my boyfriend and his parents and can I just say you wonderful ladies got me major brownie points! Thanks x 1000. Maybe it will replace the breakfast taquitos as my favorite best bites recipe. We just picked up our half a beef and have our fair share of hamburger. When I mentioned making spaghetti (yes, just jar sauce with browned meat in it), my husband said oh I really like meatballs. Well, my response… I don't know how to make meatballs. BUT now I have the perfect recipe! I tell ya, you gals are always spot on! 😉 I just love all your recipes so can't wait to try this one! Thanks!! P.S. If I knew it was that simple to make meatballs, I would have been doing it all along (I'm not a huge fan of just sauce and browned hamburger). It's silly I'm just now learning how simple it is. think I'm gonna make this tomorrow or at least, sometime this weekend! I LOVE home-made meatballs – SOOOO yummy! Best Meatballs ever! I just made these for a dinner party and never again will I just brown ground beef and add a jar of spaghetti sauce. BTW, I quadrupled the recipe and in case you were wondering 4 pounds of meat makes 110 meatballs! so I was watching Lady and the Tramp the other night and I got a sudden NEED to eat spaghetti and meatballs. I think I've only had them like once in my 22 years. Only issue is that I didnt have a recipe for it so what did I do? Instead of checking Allrecipes or Foodnetwork.com I come to my trusty OBB page in hopes to find a recipe, and these pictures are making my mouth water! Can't wait to try this tonight! Oh My Gosh! Oh my gosh, oh my gosh! I too will never make spaghetti with meat sauce again. I don't care for sausage so I just did all beef. OMG, have I mentioned that this was AWESOME? My husband was more than HAPPY to give the girls their baths after I served him this for dinner tonight! I don't think I'll ever buy another jar of spaghetti sauce. Pity that I didn't get some recipes for sauce from my ITALIAN grandmother! LOL But, I've got them now! I’ve been wanting to make meatballs for awhile now (my five year old loves them!) and have been looking for a good homemade pasta sauce too. This recipe looks yummy & simple (enough so, that I think my five year old can help me make it!) and I can’t wait to try it! This sounds devine. Definitely on the menu for the weekend. Yah, I thought my recipe for spaghetti was the best, but I made this and got great reviews. My husband has asked me to use this recipe as the go-to one. Another meal we love! I am always searching for the best spaghetti sauce that is NOT Ragu, or anything like it, but that I can make from canned tomatoes. This might be the best yet. It’s simmering right now, and I just stole a taste:-) The meatballs are awesome too! I have been using the “Meatball Nirvana” recipe from allrecipes, but I think these just took first place. THANK YOU, as always! Made 4 pounds of these the other night for the WHOLE family for a birthday celebration, and they were AMAZING!!! Loved the trick about putting them under the broiler first, super easy clean-up, and leaves the pork fat on the tin foil. Spiced up our sauce with extra red pepper flakes and used jalapeno olive oil. Thank you! Aidan, eggs are a common ingredient in meatballs. They act as a binder, holding the mixture together and keeping it moist! I made this for dinner last night and it was so good! I have been looking for a good spaghetti sauce recipe for a while now but hadn’t been able to find one I loved. My hubby and 6 kids loved it too! Thanks! So, this may seem like a lame question, but here it goes…My store sells either sweet italian sausage or spicy italian sausage. Which one do I want? Where do I find Dehydrated Onion? It’s just at the store in the spice aisle, should be really easy to find. Absolutely amazing! We had it tonight and I love this sauce so much. It’s hearty and flavorful…it reminds me of my uncle who had a pizza shop…his sauce used crushed tomatoes…..oh, and I used this sauce earlier this week on grilled pizza…..so awesome. And these meatballs rock. Seriously rock. Try this…we all loved it. I made these last night (from your cookbook) and they blew my mind! 🙂 so great. Today my little boy and I are enjoying meatball subs for lunch–he said they are his new favorite! Thanks ladies, love the site! The last few times I made these with ground turkey and spicy Italian turkey sausage and they were amazing! I didn’t even miss the beef, they had so much flavor. We love the original recipe as is too! Thanks for all your recipes! This looks GREAT Kate. It sounds a lot like our wonderful neighbor’s Italian Meatballs and Spaghetti. Love, L.
By far THE BEST meatballs I have ever tasted!!!! We LOVE these and have them at least twice a month!!! Thank you so much for this recipe.. This will be in our family for MANY years to come!!!! My boys requested heart-shaped meatballs for Valentine’s Dinner. I am going to use this delicious looking recipe to make their dreams come true. Thanks so much for these recipes in your awesome cookbook! They are such a hit here, especially when we have company over! They always ask what the ingredients are for the meatballs! I love the sausage, Parmesan cheese, and dehydrated onion in there! Brilliant flavours! And they don’t fall apart! One has to be careful to make sure the eggs aren’t too large though, as that requires the addition of much more bread crumbs (especially when the recipe is doubled)! 🙂 I love your book tip: only partly cooking the meatballs to give them shape, and then freezing them for later use! It’s been the perfect addition to meals that I give away to people. Thanks! I just made these to put in my sauce for dinner tonight. Woh Mamma!! These taste amazing! I love how easy they are too! This looks delicious!! One question- what kind of tomato sauce do you use? I have had meatball related shame for my entire adult life. I’ve tried so many recipes and they never came out good…until this one. I’ll be making it this week, my fourth time, and I always double the recipe. Instead of being a source of embarassment, “my” meatballs are now famously delicious! Thank you!! Well, it’s official. Your blog is my absolute favorite food blog, (and trust me, I look at A LOT of food blogs.) I can add this to the list of our favorites- baked potato soup, roasted egg plant spread, silk eggs, and others! We are vegetarians, so I used veggie crumbles/veggie sausage to make the meatballs. They were wonderful. Thanks for another amazing recipe!! Another winner! Almost added a little bit of salt before everything simmered, but didn’t and it turned out perfect! My husband even said that this may be the best so far!!! These are SOO STINKIN’ YUMMY!!!! The best meatballs EVER!!!! My family LOVES them… I can now say my family has a new favorite meal!!!! THANKS!!!! would there be any way to bake these? i’ve had trouble with my broiler and these looks so good! Do you use fresh basil and parsley, or the dried leaves? have you tried using Brown sugar instead of regular sugar in your sauce? give it a whirl sometime… Good recipe though. I’m so looking forward to another OBB recipe! You are my bff through a number of holidays and ladies brunches. I am looking to freeze most of the meatballs for now, but keeping some to make meatball subs for hubbys lunch tomorrow. Silly question, but how do I finish off the meatballs if they don’t simmer in your sauce for half an hour? Thanks, it’s always a pleasure to read and eat your recipes! When I make meatballs, I toast bread to the darkest. Then I run it under water, squeeze out the water and put the “meatball glue” in the mixture. It was an old tip from an Italian Mother. I also use all spare bread in the house to make Italian bread crumbs. Dry them, put in food processor with dry herbs of choice, but watch out it make your house smell amazing. Pingback: Busy days on a budget! We cooked these for dinner one night and had so many left over that I put it in freezer containers and froze them. I just pulled them out of the freezer today and put them in my crock pot on low. Should it be a problem to reheat this in a crock pot even though the sauce and meatballs were fully cooked before I froze them? I’m just not sure on all the rules of reheating and such and I would hate to make anyone sick. My family adored this recipe and so I know they will get eaten right up. I so hate the pop-up ad at the bottom of your web-site. So how in the world do you simmer spaghetti sauce uncovered without it getting all over your kitchen? Not matter how low I have it, I just get slow giant bubbles that splatter everywhere. I’ve lost track of how many times I’ve made this recipe, never disappoints and the kids love it. Thanks for sharing! Bravo Ladies!! Made this recipe for two different neighborhood families this week. In both cases, the recipients were VERY generous with compliments. Keep up the great work!! I love love love this recipe. I’ve been making it for several years and the family loved it too. I put peppers-red green yellow and zucchini in it. Also we like the spicy Italian sausage. Thank you for this great dish. You are so right that EVERYONE needs to be able to make spaghetti and meatballs! Can I put in a plug for NOT using sugar??? My Italian mother made the best sauce I have ever had. If there is anything I have learned from my mother, it is that a bit of grated carrot will cut the acidity of the tomatoes and will add that bit of sweetness naturally. Carrots are good food adding color and vitamins! I was in college before I knew that people put sugar in their sauce. It is a totally American thing. Try the grated carrot…..